Papa Meilland is a legend in the rose world. This could be due to its name – named in honour of a Doyen in the rose breeding world by his Grandson, the now famous Allain Meilland. 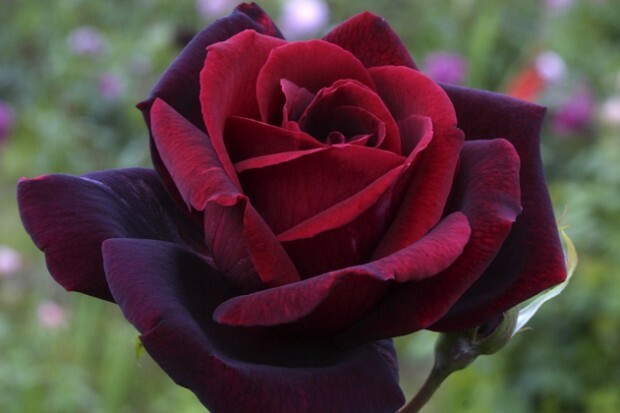 More likely, its fame is due to its dark, velvety crimson colour and magnificent, strong, old rose fragrance. This rose was bred in France and introduced in 1963 by Meilland International. Individual flowers, borne singly on straight stems are up to 12 cm wide with up to 40 petals, creating a large, full, round bloom when completely open. It has regular flushes of flowers throughout the growing season. Papa Meilland is a relatively low bush for a Hybrid Tea, approximately 1.2m high and 1m in width, making it suitable for the front row of a bed of roses. It is reasonably disease resistant and suits warm climates. The popularity of this rose was highlighted when it was chosen as a very worthy inductee into the World Federation of Rose Societies’ Rose Hall of Fame in 1988. A timeless classic rose and a most appropriate choice for December, as we start the Festive Season. Papa Meilland is highly recommended and deserves a place in all our gardens.